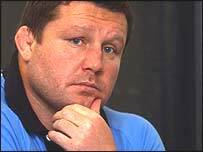 Cardiff Blues coach Dai Young says that rookie second row Bradley Davies is a future Wales great. "He'll be the next Welsh superstar, he has everything," said Young. "He has a tremendous attitude and stood up to the best locks in our games with Munster. "This World Cup may be too soon for him, but certainly by 2011 he will be one of the leading figures for Wales." Llantrisant-man Davies, 21, signed a professional deal last summer and has started to make a major impact. The 6ft 6ins, 19st giant capained Wales Under-19 to the Grand Slam in 2005 and made two Celtic League appearances for the Blues last season. After a difficult start this season, he has established himself in the Blues team. The former Yr Pant pupil was even touted for a call-up to Wales' injury-ravaged second row ahead of the Six Nations. But an ankle injury picked up in the New Year's Day win over Llanelli Scarlets is likely to keep him out of action until February. "I was identified at 14 years old when the regions came together and I've just progressed since then," said Davies. "I was slight when I was a kid and played outside-half, but then I grew tall so they stuck me in the boiler-house. "I realise I've got to take one step at a time, but it's up to me to push myself into contention." While the Blues have targeted a summer recruitment drive to bolster their thin squad, Young says he is delighted by the progress of all his youngsters at the Arms Park. "The likes of Bradley, Tom James and Rhys Shellard have come in and put their hands up," said Young. "They're getting better every game and are adding energy and excitement to the squad." 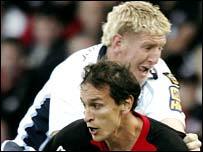 The Blues have added James Down to their Heineken Cup squad as a replacement for the injured James Goode.